The great fossil cycle and the story of a family. There was a time, long ago, when the Bardis of Florence were rich and powerful, but that branch of the family disappeared with the end of the Renaissance. The most remote ancestors of mine that I can track were living during the early 19th century and they were all poor, probably very poor. But their life, just as the life of everyone in Italy and in the rest of the world, was to change with the great fossil revolution that had started in England in the 18th century. The consequences were to spill over to Italy in the centuries that followed. My great-great grandfather Ferdinando (born in 1822) lived in an age when coal was just starting to become common and people would still use whale oil to light up their homes. He was a soldier in the infantry of the Grand-Duke of Tuscany and then of the King of Italy, when Tuscany merged into the newly formed Kingdom of Italy, in 1861. 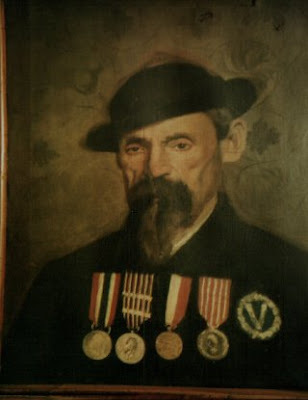 The family lore says that Ferdinando fought with Garibaldi in Southern Italy, but there is no trace of him in the records as a volunteer of Garibaldi's army. He may have fought there with the regular army, though. In his portrait, we can see the medals that he gained. Today, I still have the ribbons, the medals were lost during the 2nd world war when they were given to "the country" to support the war effort. Despite the medals, however, there is little doubt that Ferdinando was poor; his condition is described as "dire poverty" in some documents we still have. But things were changing and the conditions of the Bardi family would change, too. The coal revolution had made Northern Europe rich. England had built a World Empire using coal, France had its revolution and Napoleon, and the industrial age had started. Of course, Italy had no significant coal resources but, already in those times, coal started being imported from England and that changed many things. Tuscany was slowly building up a certain degree of prosperity based on a rapidly developing industry and on a flow of tourism from Northern Europe that, already at that time, had made of Florence a favorite destination. That had consequences on the life of Florentines. 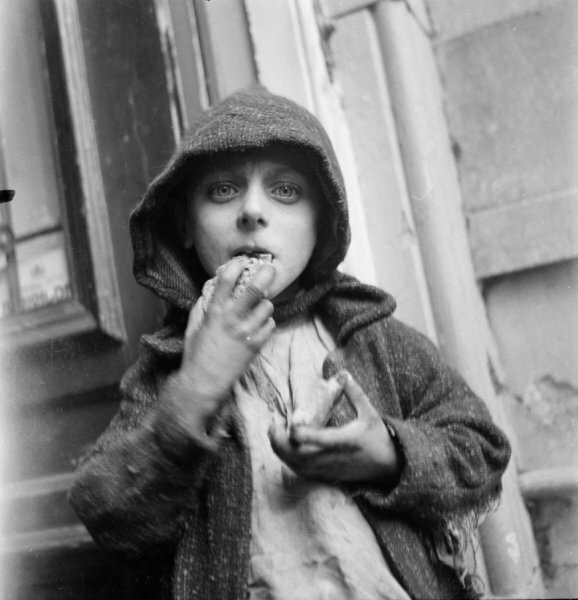 Antonio Bardi (1862 - 1924), Ferdinando's son and my great-grandfather, seems to have started his life as a street urchin. But that changed when he was befriended by a "gentleman in the service of the Emperor of Brazil," then visiting Florence. It may have happened in 1877 and some of the newspapers of that time report the story of how this gentleman, whose name was "Pedro Americo," paid for the studies of this boy in whom he had somehow noticed a special artistic talent. The papers of that time don't seem to have considered the implications (obvious for us, today) involved in the story of a mature and rich gentleman befriending a poor boy, but those were different times. In any case, Antonio started a career as a painter. That such a career was possible for Antonio was due to tourism becoming more and more common in Florence. Tourism had not just brought there the Emperor of Brazil, but a continuous flow of foreign tourists interested in ancient paintings and works of art. Color photography didn't exist at that time and this led to a brisk market of hand-made reproduction of ancient masterpieces. These reproductions were especially prized if they were made by Florentine artists, in some ways supposed to maintain the genetic imprint of the people who had created the originals. So, the main art galleries of Florence would allow local artists to set up their easels in their rooms and they would later provide them with a stamp on their canvases guaranteeing that it was "painted from the original". It seems to have been a rather diffuse occupation and, already at that time, Florentines were adapting to the opportunities that the world changes were offering to them. Some of the paintings of Antonio Bardi are still kept by his descendants and, for what I can say, he seems to have been a skilled painter with a special ability with portraits. But he never was very successful in this career and, in his later life, he moved to a job as a guardsman. Still, he had escaped the poverty trap that had affected his ancestors. Many other Florentines of that time were doing the same, although in different ways. From our viewpoint, Tuscany in the 19th century was still a desperately poor place, but its economy was rapidly growing as a result of the ongoing coal age. That opened up opportunities that had never existed before. My grandfather, Raffaello Bardi, was born in 1892. His instruction was limited, but he could read and write and perhaps he attended a professional school. When he was drafted for the Great War, he had a hard time with the defeat of the Italian Army at Caporetto, in 1917, but he managed to get back home, all in one piece. There, he married a seamstress, my grandmother Rita and he found a job in a Swiss company that had established a branch in Florence and that manufactured straw hats, exporting them all over the world. There were reasons for that company to exist and to be located in Florence. One was that the manufacturing of straw hats was a traditional activity in Tuscany, having been started already during the 18th century. Another was that the Italian economy in the 20th century had gone through a rapid growth. Many Italian regions were playing the role that today is played by Eastern European countries or South-Asian ones. They were being colonized by North European companies as sources of cheap labor. Tuscany had a well developed hydroelectric energy system and could offer a skilled workforce. Swiss, German, and British companies were flocking there to establish profitable branches for their businesses. That was the opportunity that my grandfather exploited. He was only a modest employee in the company where he worked, but he could afford a lifestyle that his ancestors couldn't even have dreamed of. In 1922, he bought a nice home for his family in the suburbs; very much in the style of the "American Dream" (although without a car in the garage). It had a garden, three bedrooms, a modern bathroom, and it could comfortably lodge my grandparents, their four children, and the additional son they had adopted: a nephew who had been orphaned when his parents had died because of the Spanish flu, in 1919. Raffaello could also afford to take his family on a vacation at the seaside for about one month every summer. He could send his sons to college, although not his daughters; women were still not supposed to study in those times. There came the Fascist government, the great crash of 1929, and the 2nd world war. Hard times for everyone but this branch of the Bardi family suffered no casualties nor great disasters. Raffaello's home also survived the allied bombing raids, even though a few steel splinters hit the outer walls. With the end of the war, the Italian economy experienced a period of growth so rapid that it was termed the "economic miracle". It was no miracle but the consequence of crude oil being cheap and easily available. The Italian industry boomed, and with it tourism. During this period, the Italian labor was not anymore so cheap as it had been in earlier times. The activity of manufacturing straw hats was taken over by Chinese firms and the Swiss company in which my grandfather had worked closed down. Still, there was a brisk business in importing Chinese-made hats in Florence, adding to them some hand-made decoration and selling the result as "Florentine hats." One of my aunts, Renza, continued to manage a cottage industry that did exactly that. My other aunt, Anna, tried to follow the footprints of her grandfather, Antonio, and to work as a painter, but she was not very successful. Tourism was booming, but people were not anymore interested in hand-made reproductions of ancient masterpieces. For my father, Giuliano, and my uncle, Antonio, both graduated in architecture, the booming Italian economy offered good opportunities. The period from the 1950s to the early 1970s was probably the richest period enjoyed by Italy in modern times and the moment of highest prosperity for the members of the Bardi family in Florence. All my relatives of that generation were rather well-off as employees or professionals. Their families were mostly organized according to the breadwinner/housewife model: even a single salary was sufficient for a comfortable life (my mother was an exception, like my father she had graduated in architecture and worked as a high-school teacher). Most of them could afford to own their homes and, in most cases, also a vacation home in the mountains or on the seaside (also here, my family was somewhat an exception, preferring a single home on the hills). They also owned at least one car, often two when their wives learned how to drive. On the average, the education level had progressed: even the women often attended college. Few of the people of that generation could speak any language but Italian and very few had traveled outside Italy, even though some of my uncles had fought in North Africa. Then, there came the crisis of the 1970s. In Italy, it was normally defined as the "congiuntura economica" a term that indicated that it was just something temporary, a hiccup that was soon to be forgotten as growth were to restart. It never did. It was the start of the great oil crisis that had started with the peaking of the US oil production. The consequences were reverberating all over the world. It was in this condition that my generation came of age. Our generation was perhaps the most schooled one in the history of Italy. Many of us had acceded to high university education; we traveled abroad, we all studied English, even though we were not necessarily proficient in it. But, when we tried to sell our skills in the labor market, it was a tough time. 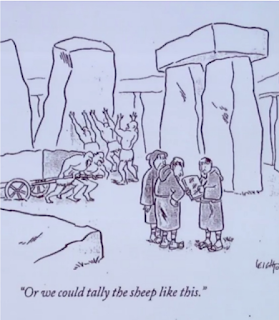 We were clearly overskilled for the kind of jobs that were available in Italy and many of us had to use again the strategy of our ancestors of old, emigrating toward foreign countries. It was the start of what we call today the "brain drain". I moved to the US for a while. I could have stayed there, but I found a decent position with the University of Florence and I came back. Maybe I did well, maybe not, it is hard to say. Some people of my age followed the same path. Some moved to foreign countries and stayed there, others came back to Italy. Some worked as employees, set up their own companies, opened up shops, they tried what they could with various degrees of success. One thing was sure: our life was way more difficult than it had been for our fathers and grandfathers. Of course, we were not as poor as our ancestors had been in the early 19th century, but supporting a family on a single salary had become nearly unthinkable. None of us could have afforded to own a home, hadn't we inherited the homes of our parents. Fortunately, families were now much smaller and we didn't have to divide these properties among too many heirs. There came the end of the 20th century and of the 2nd millennium as well. Another generation came of age and they faced difficult times again. They were badly overskilled, as we had been, perhaps even more internationalized than we were; perfect candidates for the brain drain trend. My son followed my example, moving to a foreign country to work; maybe he'll come back as I did, maybe not. It will have to be seen. My daughter still has to find a decent job. The oil crisis faded, then returned. The global peak of oil production ("peak oil") was closer and closer. The Italian economy went up and down but, on the average, down. It was a system that could grow only with low oil prices and the period of high prices that started in the early 2000s was a hard blow for Italy, causing the start of a de-industrialization trend that's still ongoing. Only agriculture and tourism are still doing well in Italy. That's especially true for Florence, a town that went through a long-term cycle that transformed it from a sleepy provincial town into a sort of giant food court. Tourists are still flocking to Florence in ever-increasing numbers, but they don't seem to be so much interested in art anymore; their focus today seems to be food. It is for this reason that, today, almost everyone I know who is under 30 is either unemployed or working in restaurants, bars, or hotels. People in Italy keep adapting to changing times as they have always done, everywhere in the world. It is hard to say what the future will bring to us, but one thing is certain: the great cycle of the fossil fuels is waning. The hard times are coming back. Zombie Apocalypse: will it be our future? Caution, this is probably the most catastrophistic post I ever published: famines, cannibalism, mass extermination and more. But, hey, this is just a scenario! (Image from "teehunter"). For those of us who delight themselves in studying long-term trends, the rise of zombies as a movie genre is a fascinating puzzle. There is no doubt that it is a strong trend: look at these results from Google Ngrams. The term "zombie" was wholly unknown in English before the 1920s, then it slowly started gaining attention. In the 1970s, it exploded, mainly after the success of the 1968 movie by George Romero "The night of the Living Dead." 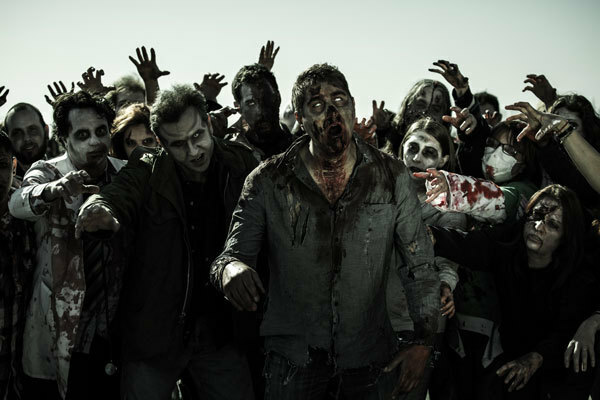 The term "zombie" wasn't used in the movie, but the concept became rapidly popular and it created the genre called "zombie apocalypse". Today, the idea is widespread: it involves the sudden appearance of a large number of undead people haunting suburbs and shopping malls, searching for live humans to eat. They are normally the target of the fire of heavily armed but much less numerous groups of people who have escaped the epidemics or whatever has turned people into zombies. Now, if something exists, there has to be a reason for it to exist. So, why this fascination with zombies? How is that we have created a genre that has never existed before in the history of human literature? Can you imagine Homer telling us that the city of Troy was besieged by zombies? Did Dante Alighieri find zombies in his visit to Hell? How about Shakespeare telling us of Henry the 5th fighting zombies at Agincourt? I think there is a reason: literature always reflects the fears and the hopes of the culture that created it; sometimes very indirectly and in symbolic ways. And, here, it may well be that zombies reflect an unsaid fear of our times, a fear that is present mainly in our subconscious: hunger. 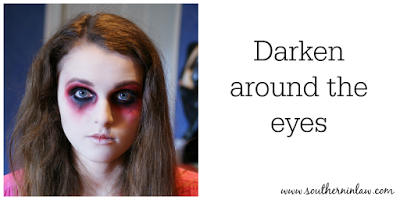 Let's start with a typical feature of zombies: the black circles around the eyes. Zombies are supposed to be "undead," cadavers that somehow returned to a semblance of life. But do cadavers have this kind of eyes? I must confess that I don't have much experience in autopsy (actually, none) but, from what I saw on the Web, it seems to me that it is rare that cadavers have those dark eye sockets; that is, unless they had developed bruises before dying. It is true that a decomposing cadaver will slowly lose the soft tissue and, eventually, the eyes will disappear leaving only dark holes in a mummified skull. But that doesn't seem to agree with the facial aspect of the zombies that appear in the movies. (I know, this was a ghoulish search, I did it in the name of science). Instead, for what I could find, dark eye sockets may be a characteristic of undernourished people, often as the result of the development of a facial edema. Here is, for instance, a photo of a Dutch girl during the famine of 1944-1945 in Holland. This is not always a characteristic of malnourished people, but it seems to occur rather frequently. 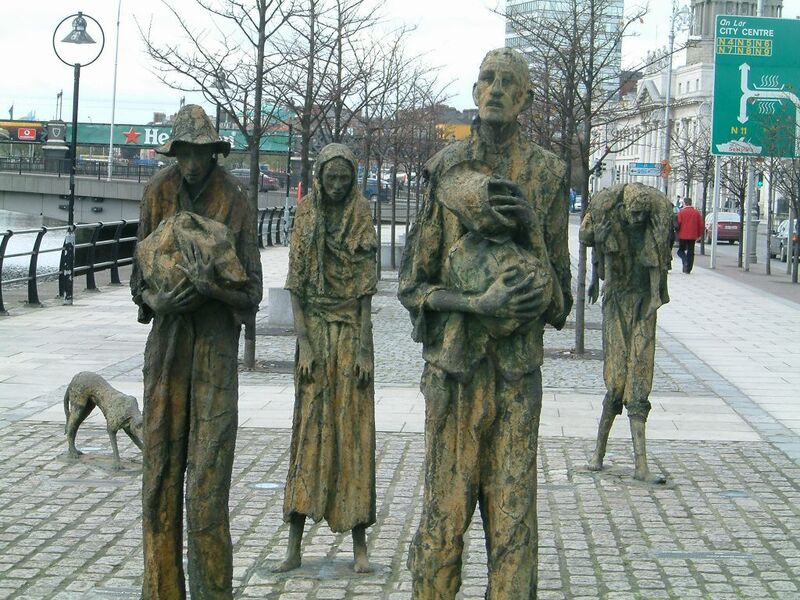 Another example is the Great Famine in Ireland that started in 1845. We don't have photos from those times, but the artists who drew pictures of starving Irish people clearly perceived this detail. 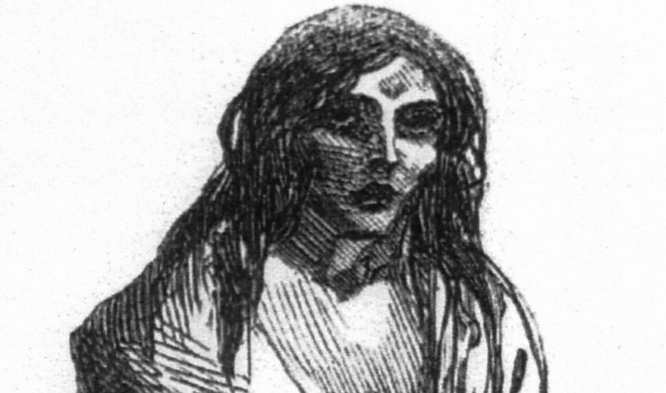 Here is, for instance, a rather well-known image of Bridget O'Donnell, one of the victims of the Great Famine. Note her darkened eyes. Do they look like the zombies of a modern movie? Yes, they do. This doesn't mean a lack of respect for the Irish men and women who perished in one of the greatest tragedies of modern times. It is only to note how, in our imagination, real starving people may be turned into imaginary undead zombies. Now, imagine that a famine were to strike our society, today. It is true that the world hasn't seen major famines for the past 40 years or so, but that doesn't mean they can't appear again. Today, our globalized commercial system is fragile, based on a long supply chain that involves maritime transportation and road distribution. The system needs low-cost fossil fuels to function and, more than that, it needs a functioning global financial system. If food travels all over the world it is because someone is paying for it. A currency crisis would make the whole system collapse. The consequences would be, well, let's try to imagine the unimaginable. People living in suburban areas have no other source of food than their shopping centers. Now, imagine that, suddenly, the ships and the trucks stop running. Then, the shelves of supermarkets can't be replenished anymore. The suburbanites would be first surprised, then angry, then desperate, and, finally, starving as their home stocks of food run out. Even before that, they would have run out of gas for their cars; the only system of transportation available to them. Now, assume that the elites would decide that it is easier for them to let the suburbanites starve and die rather than attempt to feed them. Suppose they decide to wall off the suburbia and instruct the army to shoot on sight anyone who tries to escape. Who could force them to do otherwise? We can imagine what the results would be. The inhabitants of suburban areas would become emaciated, blundering, hungry people haunting the neighborhood and the shopping malls in the desperate search of something to eat; anything. Would they turn to cannibalism? Possibly, even likely. Some of them may be able to put their hands on a good supply of guns and ammunition, then they could play king of the hill, gathering most of the remaining food and shooting dead the poor wretches who still lumber in the streets, at least until the run out of food and ammo, too. It would be the zombie apocalypse, nothing less than that. This is, of course, just a scenario, Nevertheless, I think it is interesting as an illustration of how the human mind works. In a previous post, I noted how the "overpopulation" meme disappeared from cyberspace as a result of how people gradually developed a kind of "infection resistance" to it. The zombie meme seems to be related to the same issue, but it is a much more infective meme and it is still growing and diffusing in the world's population. There are reasons for the success of the zombie meme. Fictionalized catastrophes ("it is only a movie!") are surely less threatening than those that are described as likely to happen for real. So, the concept of "Zombie Preparedness" is making inroads in many areas. Apparently, preparing for a zombie apocalypse is more socially and politically acceptable than preparing for the consequences of resource depletion and climate change. This is a curious trait of the human mind but, if this is the way it works, so be it. It makes the concept of "climate fiction" (cli-fi) an attractive one for generating preparedness for climate change. It may be that the only way for our mind to understand catastrophes to come is to see them as tales. In Ireland, before the great famine, there was some premonition of the incoming disaster. Here is what the Irish poet Clarence Mangan wrote in 1844 about an undescribed "event" that he expected to take place in the future. The Event and its terrors. 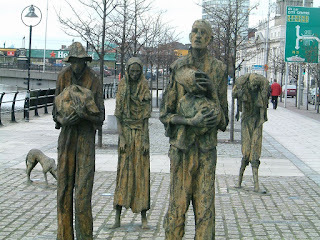 The Irish may have had some kind of premonition of the "event" that was going to hit them, the Great Famine of 1845, even though that didn't help them much to avoid it. Is a similar "Event" coming for us, too? Maybe it is already starting. The real problem with overpopulation seems to have to do with the fact that the human information dissemination and processing system (the "Cybersphere") is unable to deal with long-range planning. A single human brain is larger than a walnut, but that makes no difference. The system reacts to new information but doesn't really process it. 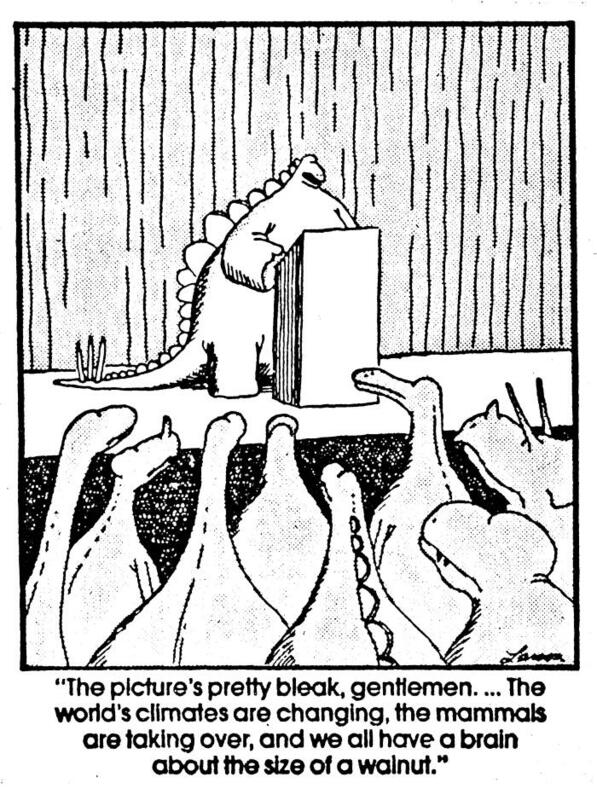 And we are no better suited than dinosaurs to survive the challenges ahead. Those of us who remember the 1970s and the 1980s may still have in mind how, in those years, speaking of overpopulation and birth control was not considered politically incorrect. Julian Simon (the "doomslayer") gives us a good description of the debate of those years (he was, needless to say, strongly against the idea that overpopulation was a problem). Yet once again there is hysteria about there being too many people, and too many babies being born. Television presents notables ranging from Andrei Sakharov to Dan Rather repeating that more people on earth mean poorer lives now and worse prospects for the future. The newspapers chime in. A typical editorial in the June 3, 1989 Washington Post (p. A14) says that "in the developing world...fertility rates impede advances in economic growth, health, and educational opportunities". Nobel- winner Leon Lederman says in his statement as candidate for the president of the American Association for the Advancement of Science that "overpopulation' is one of our "present crises" (2 June, 1989 Announcement, p. 2). The president of NOW warns that continued population growth would be a "catastrophe" (Nat Hentoff in The Washington Post, July 29, 1989, p. A17). The head of the Worcester Foundation for Experimental Biology calls for more funding for contraceptive research becasue of "Overpopulation, together with continuing deterioration of the environment..." (The Wall Street Journal, August 14, 1989, p. A9). And this is just a tiny sample of one summer. Simon's analysis is in good agreement with the results of a Google Ngram search. The term "overpopulation" reached a popularity peak in the 1970s, then it started a decline that's still ongoing. And it is impressive to note how the decline in the interest on overpopulation started while the population growth curve continued its steep increase, in particular in the poor nations of the world. So, why did people lose interest in overpopulation just while it kept becoming a bigger problem? Something similar took place with other concepts such as the limits to growth and peak oil: people are losing interest just now that these problems are becoming gigantic and probably unsolvable. I can propose a tentative explanation based on the recent work we have been performing with my coworkers, Sara Falsini and Ilaria Perissi. 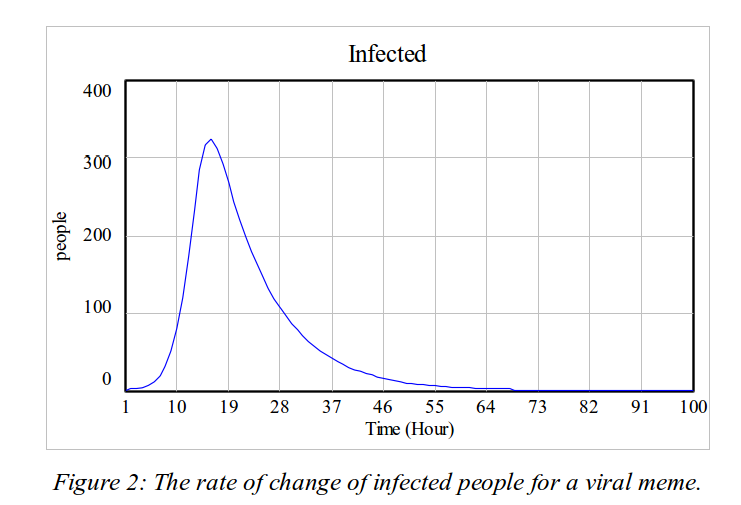 We have been examining the behavior of memes on the web using a simple viral propagation model, the same commonly used in epidemiology. 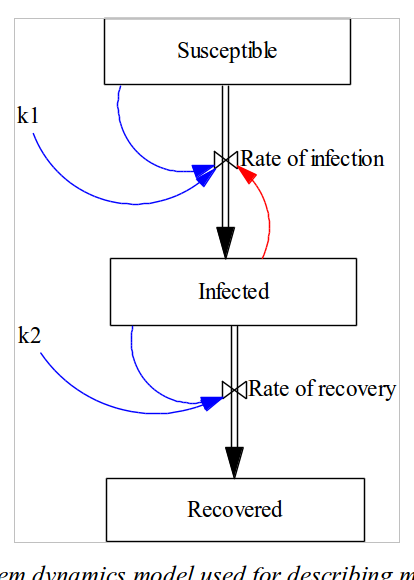 It is called the SIR (susceptible, infected, recovered) model. Here it is in a simple form (image on the right). The model depends on two parameters that describe the kinetics of propagation of the meme in the cybersphere (humankind's system of information diffusion and processing). These two parameters do NOT depend on what happens outside the cybersphere. The world's population may continue growing but the meme will go through its path, oblivious to everything that's not reported in the media. While it declines, the meme doesn't disappear, but it remains dormant. It is not infective anymore. The model can be modified to take into account re-infection, which causes the interest in the meme not to go to zero after the peak. Theoretically, this parameter could be affected by events occurring outside the cybersphere, but we found that, apparently, people rapidly become resistant to re-infection for most memes. Eventually, we have a problem that has to do with the capability of the cybersphere to process information. The cybersphere is not a "brain." When subjected external forcings in the form of memes, it reacts by readjusting some of its parameters, but no more than that. It can't act on external problems by long-term planning; it doesn't have the tools for that. We may call it a "governance" problem or, perhaps, a "command and control" problem. In any case, the system is nearly completely blind to external threats. We see this most clearly for the question of climate change. 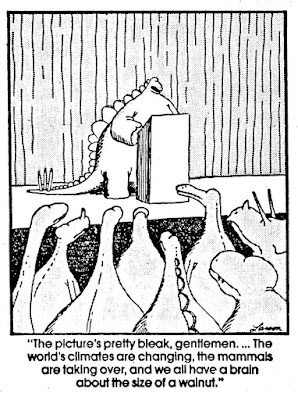 And that makes it likely that we'll go the way the dinosaurs went. The image above was shown by Charlie Hall in a recent presentation that he gave in Princeton. 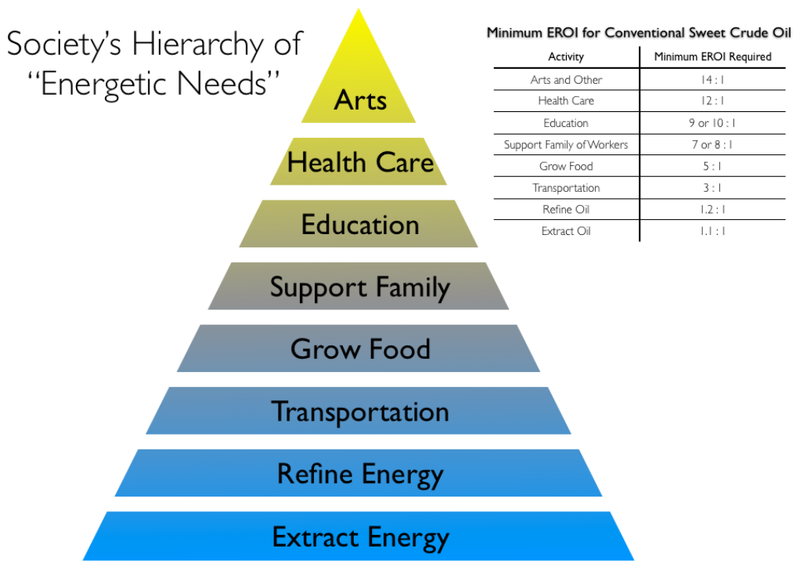 It seems logic that the more net energy is available for a civilization, the more that civilization can do, say, build cathedrals, create art, explore space, and more. But what's needed, exactly, for a civilization to exist? 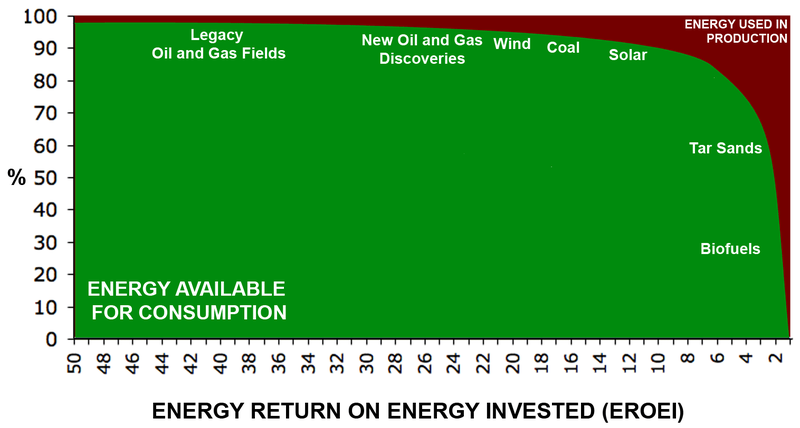 Maybe very high values of the EROEI (energy return on energy invested) are not necessary. A lively debate is ongoing on what should be the minimum energy return for energy invested (EROEI) in order to sustain a civilization. Clearly, one always wants the best returns for one's investments. And, of course, investing in something that provides a return smaller than the investment is a bad idea. So, a civilization grows and prosper on the net energy it receives, that is the energy produced minus the energy required to sustain production. The question is whether the transition from fossil fuels to renewables could provide enough energy to keep civilization alive in a form not too different from the present one. 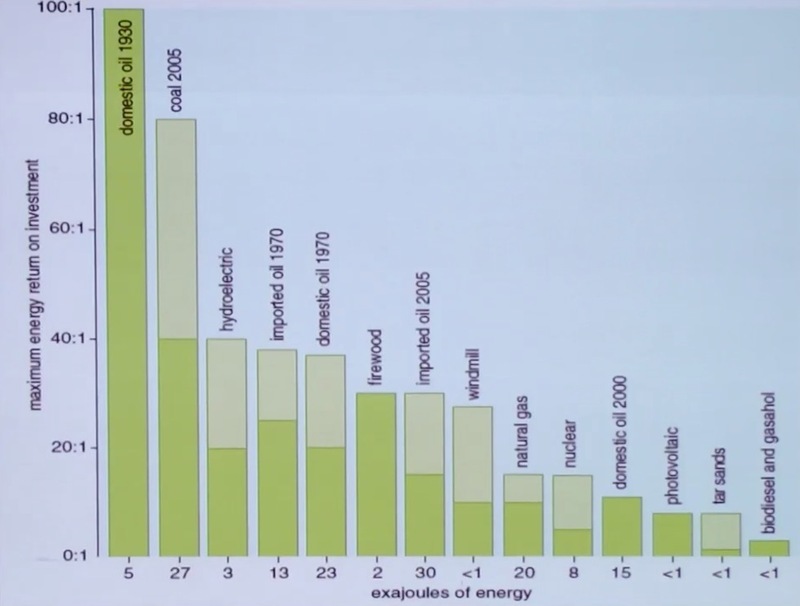 We see that the EROEI of oil is not easy to estimate but we can say at least two things: 1) our civilization was built on an energy source with an EROEI around 30-40. 2) the EROEI of oil has been going down, owing to the depletion of the most profitable (high EROEI) wells. Today, we may be producing crude oil at EROEIs between 10 and 20 on the average, and the net energy yield keeps going down. Let's move to renewables. Here, the debate often becomes dominated by emotional or political factors that seem to bring people to try to disparage renewables as much as possible. Some evidently wrong assessments, for instance, claim EROEIs smaller than one for the most promising renewable technology, photovoltaics (PV). In other cases, the game consists in enlarging the boundaries of the calculation, adding costs not directly related to the exploitation of the resource. That's why we should compare what's comparable; that is, use the same rules for evaluating the EROEI of fossil fuels and of renewable energy. If we do that, we find that, for instance, photovoltaics has an EROEI around 10. Wind energy does better than that, with an average EROEI around 20. Not bad, but not as large as crude oil in the good old days. Now, for the mother of all questions: on the basis of these data, can renewables replace the increasing energy expensive oil and sustain civilization? Here, we venture into a difficult field: what do we mean exactly as a "civilization"? What kind of civilization? Could it build cathedrals? Would it include driving SUVs? How about plane trips to Hawaii? Here, some people are very pessimistic and not just about SUVs and plane trips. On the basis of the fact that the EROEI of renewables is smaller than that of crude oil, considering also the expense of the infrastructure needed to adapt our society to the kind of energy produced by renewables, they conclude that "renewables cannot sustain a civilization that can sustain renewables." (a little like Groucho Marx's joke, "I wouldn't want to belong to a club that accepts people like me as members."). Maybe, but I beg to differ. Let me explain with an example. Suppose, just for the sake of argument, that the energy source that powers society has an EROEI equal to 2. You would think that this is an abysmally low value and that it couldn't support anything more than a society of mountain shepherds or not even that. But think about what an EROEI of 2 implies: for each energy producing plant in operation there must be a second one of the same size that only produces the energy that will be used to replace both plants after that they have gone through their lifetime. And the energy produced by the first plant is net energy fully available to society for all the needed uses, including cathedrals if needed. Now, consider a power source that has an EROEI= infinity; then you don't need the second plant or, if you have it, you can make twice as many cathedrals. In the end, the difference between two and infinity in terms the investments necessary to maintain the energy producing system is only a factor of two. You see that oil, wind, coal, and solar are all in the same range. As long as the EROEI is higher than about 5-10, the energy return is reasonably good, at most you have to re-invest 10% of the production to keep the system going. It is only when the EROEI becomes smaller than ca. 2 that things become awkward. 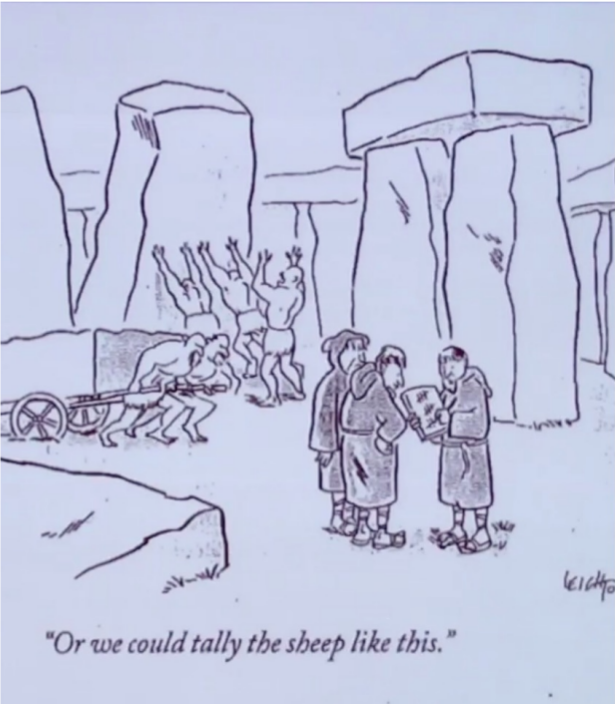 So, it doesn't seem to be so difficult to support a complex civilization with the technologies we have. 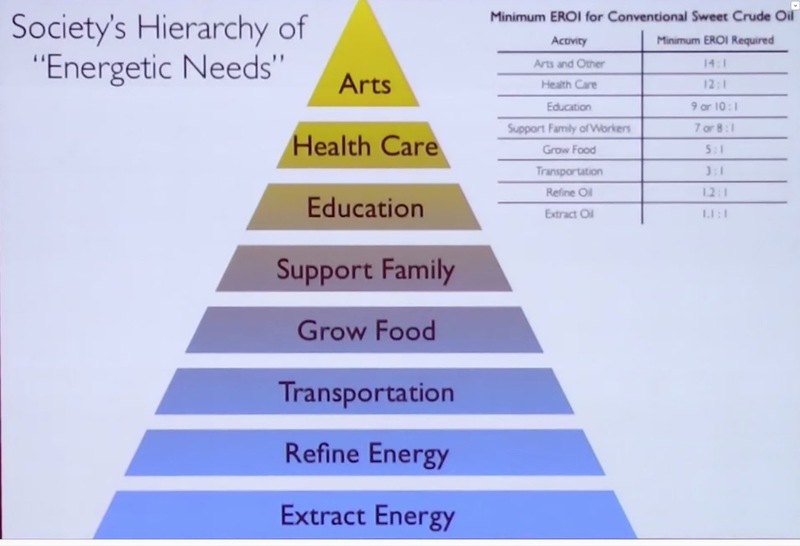 Maybe trips to Hawaii and SUVs wouldn't be included in a PV-based society (note the low EROEI of biofuels) but about art, science, health care, and the like, well, what's the problem? Actually, there is a problem. It has to do with growth. Let me go back to the example I made before, that of a hypothetical energy technology that has an EROEI = 2. If this energy return is calculated over a lifetime of 25 years, it means that the best that can be done in terms of growth is to double the number of plants over 25 years, a yearly growth rate of less than 3%. And that in the hypothesis that all the energy produced by the plants would go to make more plants which, of course, makes no sense. If we assume that, say, 10% of the energy produced is invested in new plants then, with EROEI=2, growth can be at most of the order of 0.3%. Even with an EROEI =10, we can't reasonably expect renewables to push their own growth at rates higher than 1%-2%(*). Things were different in the good old days, up to about 1970, when, with an EROEI around 40, crude oil production grew at a yearly rate of 7%. It seemed normal, at that time, but it was the result of very special conditions. Our society is fixated on growth and people seem to be unable to conceive that it could be otherwise. But renewables, with the present values of the EROEI, can't support a fast growing society. But is that a bad thing? I wouldn't say so. We have grown enough with crude oil, actually way too much. Slowing down, and even going back a little, can only improve the situation. So, it is true: planes fly slower nowadays! The video, above, shows that plane trips are today more than 10% longer than they were in the 1960s and 1970s for the same distance. Airlines, it seems, attained their "peak speed" during those decades. It is remarkable how things change. Do you remember the hype of the 1950s and 1960s? 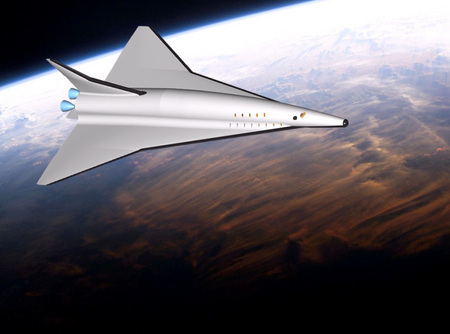 The people who opposed the building of supersonic passenger planes were considered to be against humankind's manifest destiny. Speed had to increase because it had always been doing so and technology would have provided us with the means to continue moving faster. Rising oil prices dealt a death blow to that attitude. The supersonic Concorde was a flying mistake that was built nevertheless (a manifestation of French Grandeur). Fortunately, other weird ideas didn't make it, such as the sub-orbital plane that should have shot passengers from Paris to New York in less than one hour. Note added after publication. Out of curiosity, and also as the results of some comments received for this post, I went to look at the rated cruising speed of various passenger planes. It seems that there is no detectable change in the reported values for similar planes, from the Comet to the Airbus 350. Still, the schedules indicate a slowdown of about 12% in the flight time. In part, I think it is to take into account the crowding of airports but also, in part, there has to be some leeway in how the plane is flown; it can be probably be slowed down, a little, from its rated cruising speed with a small improvement in fuel efficiency. This is a post by François-Xavier Chevallerau, a Brussels-based public policy professional who is in the process of setting up a new international think tank to support the emergence and promotion of biophysical economics in the public debate and the policy conversation. Here, he comments on the "Hill's Report" that was also discussed in a previous post on "Cassandra's Legacy." In December 2013, an ‘association of consulting engineers and professional project managers’ calling themselves ‘The Hill’s Group‘ published a report titled ‘Depletion: A determination for the world’s petroleum reserve’. Depletion, as is well known, is the inevitable consequence of non-renewable resource extraction, and determining how this depletion will affect petroleum production has been a key focus of energy analysts and researchers for a long time. Arriving at an estimate for the remaining extractable petroleum reserve is usually attempted by adding together the quantity of petroleum believed to be present in each field, a method which is error-prone and imprecise. The Hill’s Group’s study proposed an alternative model of oil extraction and depletion, rooted in thermodynamics – i.e. the branch of physical science that deals with the relations between all forms of energy. This model, called ‘ETP’ (Total Production Energy), is allegedly derived from the fundamental physical properties of petroleum, the first and second laws of thermodynamics, and the production history of petroleum. The methodology used by The Hill’s Group is based on ‘exergy analysis’. Exergy in thermodynamics means ‘the maximum amount of work that can be extracted from a system’. The system being considered, in this case, is a unit of petroleum. The Hill’s Group’s study calculates the maximum amount of work that can be extracted from a unit of petroleum, using the physical properties of the crude oil in question, equations derived from studies of the First and Second Laws of thermodynamics, and the cumulative production history of petroleum. It then uses these these values to construct a mathematical model that it claims can predict the status of the world’s petroleum reserve with a much smaller margin of error than can be provided by the quantity measurement approach. Optimistic estimates place the world’s total petroleum reserve at 4,300 billion barrels. Of that quantity the model proposed by The Hill’s Group predicts that it will only be possible to extract 1,760.5 billion barrels, or 40.9% of the total reserve. Its model suggests that petroleum’s ability to supply the energy needed to sustain its own production process is declining, that petroleum depletion is further advanced than generally assumed and that oil production will decline or even collapse much faster than commonly anticipated. 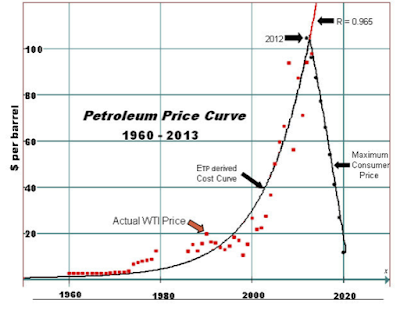 From its ETP model the Hill’s Group also derives a petroleum cost curve, which it says maps the price of petroleum since 1960 with a correlation coefficient of 0.965, making it the most accurate oil pricing model ever developed. 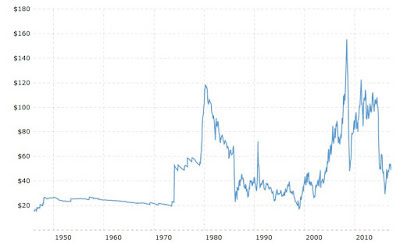 It also says that the price of oil depends, in addition to production costs, on the amount that the end consumer can afford to pay for it, and derives from its ETP model a Maximum Consumer Price curve, representing the maximum price that the end consumer can pay over time for petroleum. It is based on the observation that the price of a unit of petroleum can not exceed the value of the economic activity that the energy it supplies to the end consumer can generate. According to the Hill’s Group, its model shows that 2012 was the energy half way point for petroleum production, i.e. it was the year when one half of the energy content of the petroleum extracted was required to produce the petroleum and its products. 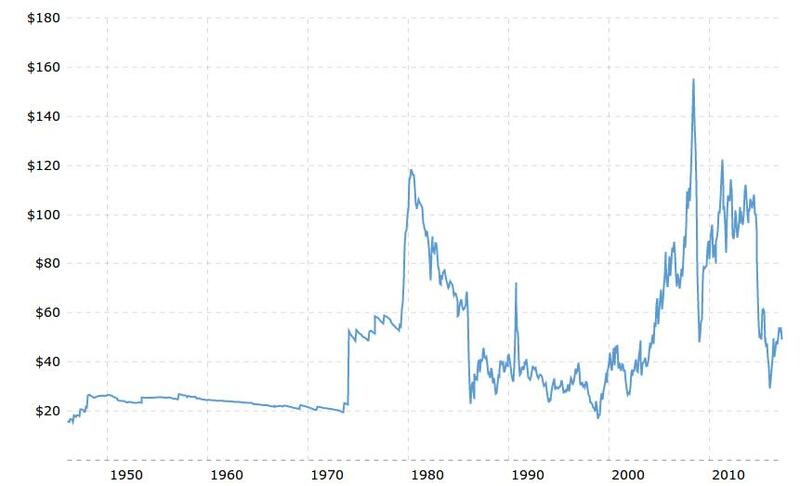 From then on, it says, the price of oil can only be pulled down along the descending Maximum Consumer Price curve, which it says is curtailed at $11.76/ barrel in 2020. At this point petroleum will no longer be acting as a significant energy source for the economy, and its only function will be as an energy carrier for other sources. In other words, the oil industry as we know it will disintegrate, with a myriad of negative consequences for the world economy. 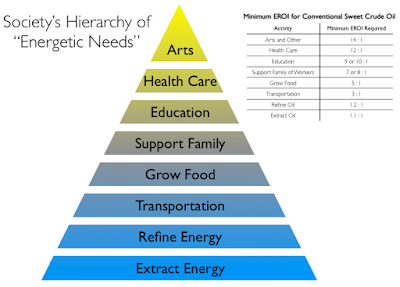 ‘SK’, a professor emeritus in the department of Mechanical and Aeronautical Engineering at a Major U.S. University, delivered a strong critique of the ETP oil extraction model at peakoilbarrel.com. The fact that The Hill’s Group said that a threshold for oil markets was passed in 2012 and that oil prices would tend to go down shortly after seems to give the report a superficial credibility. But according to SK the thermodynamic analysis is incorrect and therefore any calculations and graphs based on this analysis must also be unreliable. Spanish physicist Antonio Turiel published on his website an analysis of the theoretical basis of the ETP model (in Spanish). Applying the principles of thermodynamics to evaluate the limits of the oil’s capacity to deliver net energy to society makes sense, he says, provided it is done in a proper way. 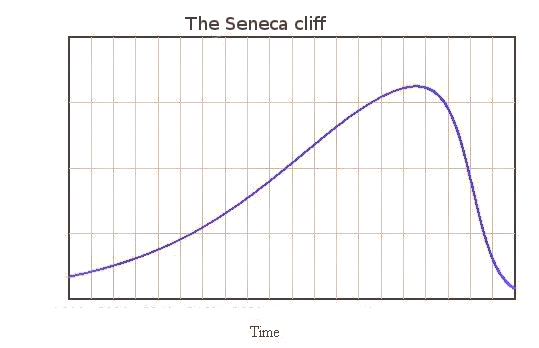 The ETP model, however, is according to him based on an incorrect use of thermodynamic theory, erroneous deductions, definitions that do not make sense from a physics point of view, deficient data processing, and ignorance of the interactions between oil production and the economy as well as other energy sources. Given these important shortcomings, he says, the ETP model cannot be used for a serious discussion of oil depletion, at least not until it is fundamentally revised and rebuilt. 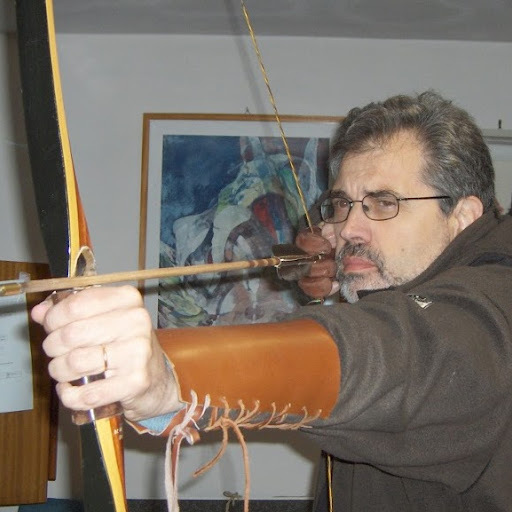 Prof. Ugo Bardi from the University of Florence is also taking aim with the Hill’s Group’s work in a recent blog post. The Hill’s Group’s report, he says, is badly flawed. While it is true that the oil industry is in trouble, the calculations by the Hill’s group are, at best, irrelevant and probably simply plain wrong. 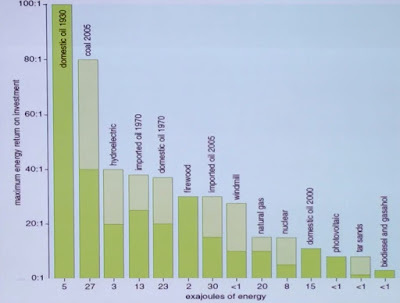 The problem of diminishing energy returns of oil production is real, Bardi says, but the way to study it is based on the ‘life cycle analysis’ (LCA) of the process. This method takes into account entropy indirectly, in terms of heat losses, without attempting the impossible task of calculating it from textbook thermodynamic principles. By means of this method, we can understand that oil production still provides a reasonable energy return on investment (EROI). It is anyway erroneous, says Bardi, to draw conclusions regarding the economy from net energy analysis. The economy is a complex adaptative system that evolves in ways that cannot be understood in terms of mere energy return considerations. This controversy surrounding the Hill’s Group’s report reveals some inconvenient truths that the ‘peak oil’ community now has to face. The Group’s work was widely embraced and disseminated in this community, with no or limited critical scrutiny. It indeed has an aura of scientific accuracy that comes from its use of basic thermodynamic principles and of the concept of entropy, correctly understood as the force behind the depletion problem. But behind the thermodynamic terminology, it proposes a series of assumptions, not always explicit, and of complex mathematical calculations that nobody until recently had apparently taken the time to review. As pointed out by Antonio Turiel, the Hill’s Group’s work would probably not have passed a proper peer review process in its current form. Yet the report was widely accepted and commented in the ‘peak oil’ community. According to Ugo Bardi, this episode shows that “a report that claims to be based on thermodynamics and uses resounding words such as ‘entropy’ plays into the human tendency of believing what one wants to believe“. As many in the ‘peak oil’ community want to believe in imminent collapse and disaster, works like the Hill’s Group’s report that are perceived as providing a serious scientific basis to catastrophism are widely embraced. If the scientific basis is revealed to be not as sound as initially thought, as seems to be the case for the Hill’s Group’s work, then its embrace and dissemination can only be detrimental to the peak oil community and undermine its credibility. 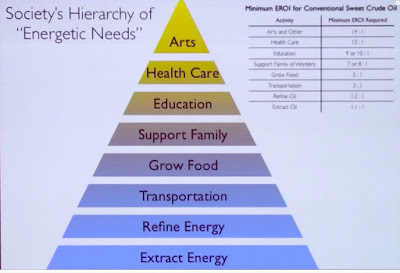 Waiting for a more affordable digital version of Charles Hall's Energy Return on Investment: A Unifying Principle for Biology, Economics, and Sustainability I watched a seminar on the same subject held by prof Hall less than a year ago at Princeton. I enjoyed his talk, I believe it summarizes well the main subject of discussion of this blog: the fate of the artificial energy supply. Without it we would go hungry, 2/3 of the fertilizers today are synthetic and much more depends on it. Many prefer reading a text rather than watching a video but, in this case, it helps to detect the author's emotions directly from his voice. It contains a lot of well-summarized information together with strong, sometimes debatable, statements but I appreciate his spirit and courage. I feel his frustration for still missing the perfect theoretical context where to locate the issues. As a lightning short summary for the ones who couldn't listen to the whole talk, I propose the following images from his video. These two images show that we need to make exceptional efforts to afford even basic "luxuries" with the exclusive use of renewables. There is a lot to disagree about quantitatively, for example in this blog look at this Hall-Bardi dialogue. The last image hints to what's probably the main ingredient to the "problem" solution. The most flexible, least technologically sophisticated way of satisfying the world energy needs is most likely to reduce energy demand, the product among population density, the quality of its needs and their energy intensity.